Business communication has come a long way in the last few decades. With the evolving technology and constant urge to reach more and more people within time, the business industry is showcasing great efforts in enhancing their communicative methods. Keeping in notion the primitive requirement of communicating with humongous target audiences, the business industry has recently evolved with a very effective and efficient communication method that has changed the way one can ever imagine the usage of SMS services in mobile communication. Known as SMPP SMS services, short messaging peer to peer SMS service is the new and trendy way of harnessing the benefits of SMS in the field of business communication. Initially developed to test the efficiency of messaging applications, SMPP services now stand as the one-stop target for business organizations which wish to communicate with thousands of customers within seconds. Generally called as SMPP SMS services, Short messaging peer to peer protocol is a way technological standards allow the communicators to communicate with thousands of individuals together. 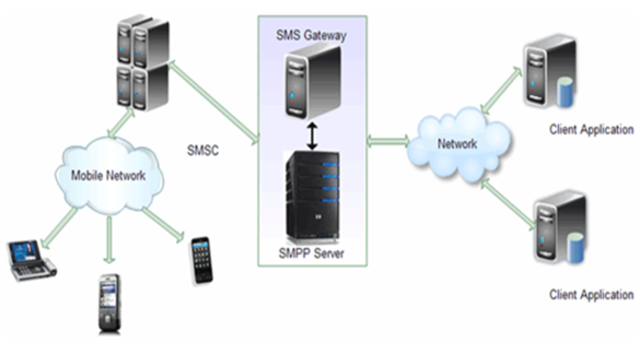 Speaking on the technical grounds, the SMPP SMS service serves as the medium through which the short messaging service centers (SMSC) and GSM Unstructured service data units (USSD) can interact with the messaging applications. Adding to the details, the standard practice involves a centralized messaging server that shall act as the pivotal point in communication. Apart from this pivotal point, there exist external messaging servers. While the former centers act as server sides, the latter deemed to be the client entity for the given transactional duration. Generally, the external entities target feeding SMSC with a huge number of messages which shall be then transmitted/ sent to the given target audience. However, the entire process demands proper application integration which can act as the adhesive layer between the above two entities and ensure proper communication within them. SMPP server API does exactly the same and allures SMPP standard protocol to attain its significance. Thus, by employing SMPP services for communication purpose, one can send and receive messages to CDMA, TDMA, and GSM networked mobile phones in a convenient and effective mannerism. Since these networks hold well in all regions and pertain no geographical barriers, the communication can be performed without and hurdles and the SMSs can be sent rapidly to the recipients situated anywhere in the world. The messages can also be sent using restful APIs. However, these APIs lack efficiency in numbers. One can communicate with merely 100 – 150 contacts at once using restful APIs. This number is surely very small for institutions who wish to communicate with thousands of customers simultaneously. SMPP technology plays the role here. By choosing SMPP standards, the organization is featured to communicate with thousands of recipients in single shots and thus take business communication to an all new and enhanced stature. This power of communication with a humongous mob is bestowed to the services by methods of directly using telecommunication networks to transmit and receive messages. By employing direct telecommunication, the SMPP SMS can be sent and received by organizations from and to anywhere in the world without wondering about the geographical locations. Though a recent technical enhancement, SMPP services have been encountering all types of telecommunication networks. May it be GSM, TDMA or CDMA; the SMPP versions cover all of them. Generally, version 3.4 is utilized in today’s business architectures. The below versions give up the strength to the services and are widely received by businesses as per their needs. Version 3.4: Though being the oldest version in the hierarchy, this version is greatly honored by units which find their target audiences connected using GSM telecommunication. In spite of numerous limitations and single communicative efficiencies, version 3.3 is capable of effectively supporting GSM. The version is featured to establish two designated communicative channels to send and receive SMS. Thus, one stands as the receiving channel, while the other plays the role of an outgoing channel. Version 3.4: A successor to the former version, V3.4 has been widely honored owing to its enhanced features and capabilities which v3.3 lacked. Along with serving GSM support, this version comes with tag length value parameters (technically referred to as TLV parameters) and also supports non- GSM SMS networks. As the enhancement, this version is capable of transmitting and receiving messages from the external sources using a single channel. Thus, the channel acts as the trans-receiving medium for the exchange of messages. As stated, this version is currently employed in business architectures which communicate with the target audiences using SMPP SMS services. Version 3.5: The latest successor to the legacy, version 3.5 has been enabled with all the features its ancestor versions sustained. However, what makes it the new age player is its capability to support broadcasting services. Thus, the service can now establish connections using one-to-many principle and enhance the way SMPP communication takes place. Not only will the communication speed be enhanced drastically but also the sustainability of servers can be allured for good of the business. As per the systems demand, SMPP technology can be implemented for any business unit. Depending on the existing business architecture, the SMPP protocols may be applied and subjected to scalability in accordance with the business.